Do you need a better way to manage the monitoring of your social media? Don’t want to spend a lot of money? How about a free alternative? Google Alerts has its uses, but it is simply not effective as a stand-alone tool for monitoring social media conversations on a day-to-day basis. Dozens of paid options exist, including Radian6, SAS and Lithium. However, with an RSS reader and some Internet savvy, you can build a powerful social media listening post at no cost. This article will show you how. Knowing where your company is mentioned online, who’s doing the mentioning and how others are responding is crucial to 1) understanding the “buzz” about you, 2) addressing complaints and negative mentions quickly, 3) knowing the impact (or lack thereof) of your marketing efforts, and 4) shaping social media marketing efforts to reach the right people (key influencers) on their preferred platform. A “feed” is a summary of web content that is updated on a regular basis. It allows users to keep informed of a website’s latest changes. The predominant feed format is Really Simple Syndication (RSS) 2.0. Feeds allow you to easily see new content. A summary or “headline” view lets you quickly scan recent content changes, and headlines are linked to their appropriate content. RSS readers are very useful because you no longer have to search for relevant information; you simply save your search queries in the reader and the relevant information will come to you. Unless you have another blog aggregator that you prefer, I recommend you sign up for Google Reader. The first time you log in, the screen will look like this. The remainder of this article will show you how to use an RSS reader to build a social media dashboard. Go to Google News and enter a query into the search box. I recommend you use complex queries when possible, as they provide more focused results. If your query returns items that are relevant, scroll down and click the RSS button at the very bottom of the page. On most sites they appear as orange badges. After clicking the button, copy the URL of the page that comes up. This is the RSS feed for your search query. You just want the URL (indicated by the arrow). 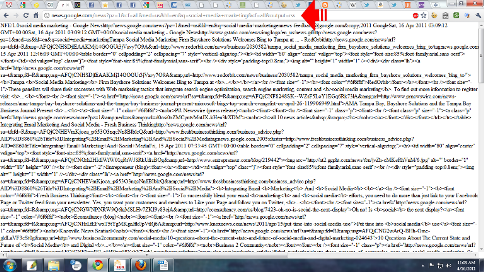 The rest of the page is not intended for humans to read, but for an RSS aggregator like Google Reader. 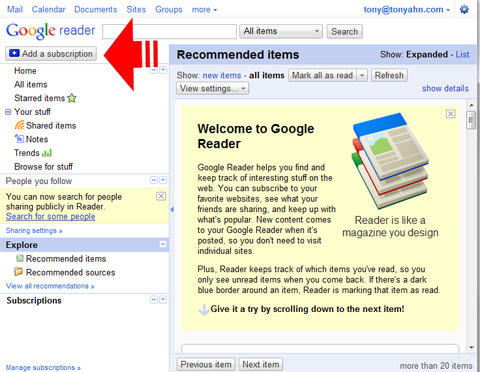 Go back to Google Reader and click the “Add a Subscription” button in the upper left corner. I’ve marked it in the screenshot above with an arrow. Paste the URL into the form field that appears. Now every time a new article that fits your search query goes live, it will be added to your Google Reader. Add as many query feeds as produce articles relevant to your brand or industry. 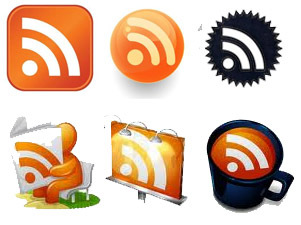 Here's a selection of RSS Feed badges, both traditional and creative, that you may find on blogs. Go to Google Blog Search and run search queries, pasting the RSS feeds of queries with relevant results into Google Reader as above. Wikipedia is where experts, industry leaders, researchers and other key influencers talk. You may have thought it was just an online encyclopedia, but it has a forum for every single article posted. Lively discussions are often ongoing behind the scenes, as each article has its own discussion page where Wikipedia editors debate and discuss. You’ll want to know what people are saying about your page, your competitors and your industry. Subscribe both to edits made to each article you select as well as its corresponding discussion page, in order to monitor what people are saying. View History shows you a log of all edits made, along with the time, editor and often a summary of the changes. 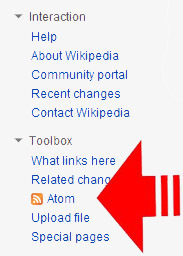 To do this, select the “History” tab above the article, then on the left sidebar click “Toolbox” and then “Atom” with the orange RSS badge next to it. Paste the URL into Google Reader. If you want to subscribe to discussion on the article as well, click the “Discussion” tab above the article, then click “History” then “Atom” as described above. You may also want to subscribe to pages about your competition or about the industry itself. Atom is a type of RSS feed and works exactly the same way. Find the button in the left sidebar. Twitter is one of the main places online that comments go viral. Companies like Dell and Southwest Airlines monitor Twitter in real time so that a negative tweet about a product or service can be addressed quickly by customer service. It is also important to note that Google indexes tweets. If your company, product or brand is being tweeted about, you’ll want to know. Luckily, Twitter is equipped to send information to your social media dashboard. Go to Twitter Search, run a search query, click the “Feed for this query” link next to the orange RSS button, and paste the URL in your aggregator. Twitter searches can be imported to your social media dashboard. All tweets you monitor will be stored for you. Are you regionally focused, or is your audience in a single country? Click the “Advanced Search” link to the right and set your parameters. 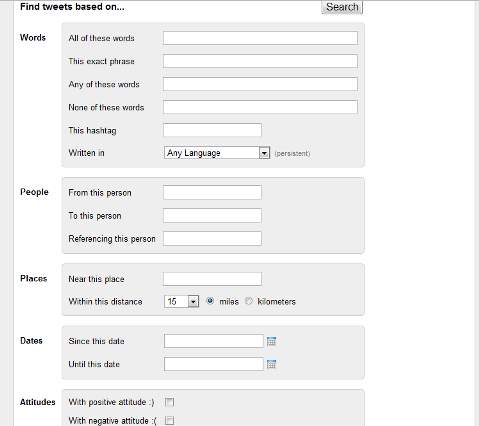 You can even specify whether you want to see positive or negative tweets, or tweets that ask a question! Advanced search in Twitter is a powerful way to find exactly what you're looking for. Go to Samepoint. This is an engine searching millions of conversations taking place on blogs and social media sites. User-generated discussions (other than Twitter) are typically not indexed by major search engines, such as Google, as they do not reside on static pages. SamePoint converts these discussions into web pages, or permalinks, and organizes them within a tag cloud. Enter your search query and subscribe to the feed, just like above. 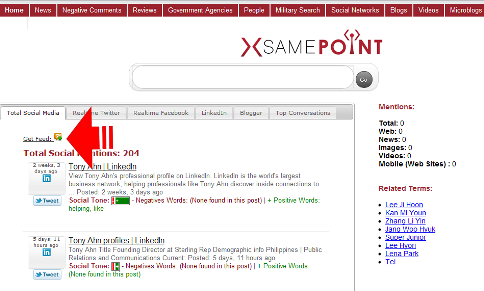 Samepoint search results actually show sentiment analysis with their "social tone" indicator. Go to BoardTracker. This engine searches over 2.4 million live message boards and discussion groups. While Google searches message boards as well, BoardTracker serves up better results. Run your search query and grab the RSS feeds. 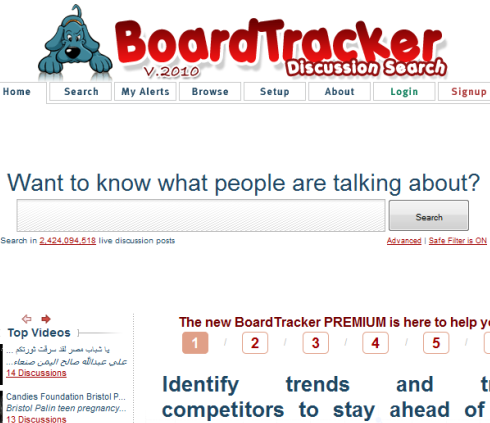 BoardTracker will draw back the curtain on Internet forums, showing you what people are saying about your product, service or brand. The above feeds are required for in-depth monitoring of your brand and/or industry. The following feeds are optional, depending on your particular circumstances. If your industry has strong aftermarket sales, you may wish to monitor prices. eBay and Craigslist are the top aftermarket sales sites. The prices people are paying for your products there will help you determine aftermarket value. Go to eBay. Enter a search query. Scroll to the bottom and click the orange RSS button, and paste the link in your aggregator. Go to Craigslist. Enter a search term. Look for the RSS feed. You know what to do. If you want to monitor your competition, or any webpage in particular, subscribe to an RSS feed at WatchThatPage. It will notify you any time a page is changed. WatchThatPage can extract new information from multiple web pages. #5: What About Facebook and LinkedIn? Facebook and LinkedIn are noticeably absent from this social media monitoring dashboard. Why? Because both platforms have privacy settings that preclude interacting with the general public. Users must register, and then they can only interact with their friends/contacts (with the exception of Facebook Pages, which are indexable by the search engines, and LinkedIn Today, which is an aggregation of other news sources). There’s not a search engine around that can search a closed network, at least not as of this writing. 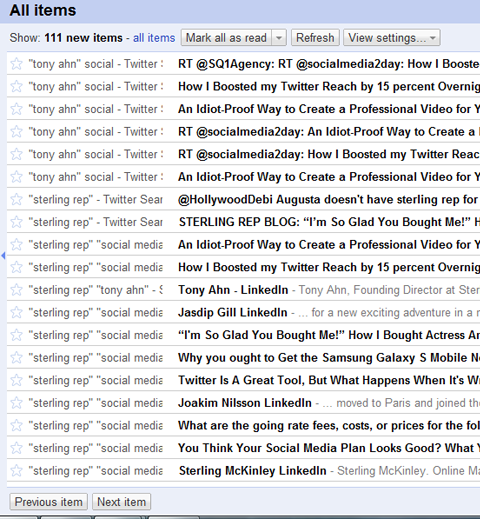 This is a screen shot of the social media dashboard for my company, Sterling Rep Social Media. As you can see, I can quickly scan the list for items of interest. While most of these are mentions of my blog posts, if someone mentioned my company (or me) online in a blog comment, forum, on Twitter or in the news, it would show up here. The above plan will allow you to construct a powerful social media listening post, free of charge. It is searchable, saves all records indefinitely, and is updated upon refresh. Using it will give you a significant advantage over your competition if they’re still just using Google Alerts. Tony Ahn is the owner of Sterling Rep Social Media, a firm providing online reputation management, web presence development and social media services to clients in Manila, Philippines and around the world.